We’re talking about a guy TIME magazine named one of the “Top 100 Most Influential People in the World.” Men’s Fitness magazine hailed him as one of the fittest men on the planet. An internationally recognized endurance athlete, NY Times bestselling author, in demand public speaker, and successful entrepreneur, Dean has pushed his body, mind and spirit to places most people simply cannot fathom. Given all of these feats of astounding endurance and more, Dean is widely lauded as one of the greatest athletes of our time — an accolade deserved if you ask me. But it wasn’t alway this way. After success on the track in high school, Dean put running in his rear view in favor of business. But by age 30, he found himself at a spiritual crossroads. Dissatisfied with the successful, comfortable life he had built for himself, he yearned for something more. He yearned for challenge. He yearned for discomfort. He yearned for struggle. Because to struggle is to be alive. After a now famous drunken all night run following his 30th birthday party, the rest is well documented running history. Dean chronicles his discovery and love of running in his bestselling memoir Ultramarathon Man– a must read for anyone who loves an inspirational story of adversity and personal triumph — and his journey continues in his follow up tomes 50/50, and Run! Not enough? Dean is currently hard at work on a new book – a novelized look at the amazing life of Pheidippedes, the legendary Greek who ran from Marathon to Athens to deliver news of a military victory against the Persians, a subject close to Dean’s heart given his Greek heritage. How does Dean do it? Some chalk it up to genetics – a freakishly high lactate threshold; an unnaturally high tolerance for pain; and an unusual ability to tolerate sleep deprivation Setting aside debate on whether these mental and physiological data points are earned or inherited, I feel compelled to say that the answer to this question is far more complex. And far more interesting. Dean: Any desire to spend a few relaxing days out in Death Valley this summer? Me: Are you asking me what I think you’re asking me? Indeed he was. A formal invite to help support Dean’s 10th assault on the legendary Badwater 135– widely considered the world’s toughest footrace. It was an offer I simply could not refuse. Beyond the honor, it was an extraordinary experience (for my first-hand account, check out my podcast chat with Josh Spector last year – episode #40 ). I have to say I was in over my head on this one – I simply hadn’t been training that much at the time — but I am so grateful for the experience, one I won’t soon forget. Myself, along with Jason Koop, Brendan Freise and Nathan Peerbolt spent 24 hours pacing Dean across Death Valley and up the Mt. Whitney portals. My personal highlight was running alongside Dean through a huge portion of the night straight through to daybreak. Despite the pain he endured, Dean found the wherewithal to talk to me at length about everything — running, writing, marriage, family, business and just everyday life. When the sun rose, I felt like I knew the real Dean. Over the course of that 24 hour race, I saw Dean sail and I saw him struggle. I observed how he handled incredible duress and extraordinary suffering in 130 F temperatures unfit for humans. I witnessed how patience and experience and faith and sheer determination got him through the countless tough spots, the dark abyss and ultimately across the Badwater finish line for the 10th time. And not for nothing, in the days before and after the race I took note of how he navigates his fame and popularity with gentlemanly presence, grace and gratitude. I consider this man to be one of the great champions of our time. A true role model. An inspiration to me personally and to millions worldwide. And someone I am lucky to call both a mentor and a friend. 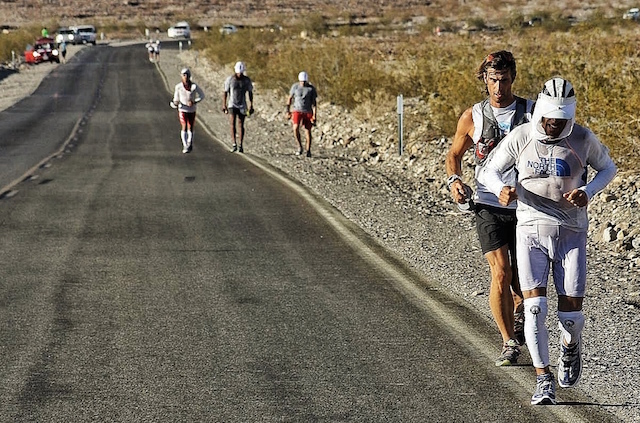 So what makes Dean Karnazes the most successful ultra-distance runner on Earth? Now in his 50’s, how has Dean’s perspective on nutrition evolved? After accomplishing so much, what continues to drive him? How is he able to run such great distances seemingly without fatigue? And how does he successfully balance his running with his philanthropic endeavors, raising kids, maintaining a healthy marriage, running a successful business, his countless speaking engagements, appearances and travel commitments? Well, let’s find out. I sincerely hope you enjoy this week’s conversation. P.S. This is a special week. We just celebrated the show’s 2 year anniversary and we just surpassed 4 million total podcast downloads! Wow. That’s a lot of downloads. I don’t know what to say. I’m elated, happy, grateful and humbled more than you know. Appropriate given the import of this particular holiday weekend. If you’ve been with me from the start, you are familiar with our humble beginnings. I launched this thing with no attachment to the result. My expectations for all of this were zero. I just felt this urge to continue the conversation that Finding Ultra had started by sharing some of the people, information, knowledge, inspiration and tools that have been so helpful to me along this path. I’m blown away by what the show has become and can’t thank all of you enough for all the passion, support and for, well, just being an incredible audience. All I can say is that I promise to keep getting better at this – upping my game – and will do everything in my power to bring you the best people and information I can. Anyway, just a long winded thanks — you guys are awesome. P.P.S. We’re running a sale! Now through December 20, get $10 off on all t-shirts, $10 off our Repair plant-based protein supplement and two for one on all B12 purchases!